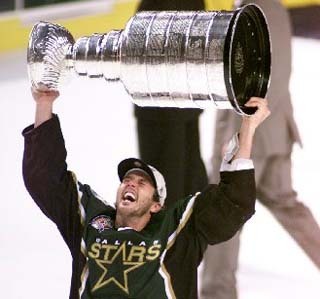 The 1999 Stanley Cup Final NHL championship series was contested by the Eastern Conference champion Buffalo Sabres and the Western Conference champion Dallas Stars. It was the 106th year of the Stanley Cup. The Sabres were led by captain Michael Peca, coach Lindy Ruff and goalie Dominik Hasek. The Stars were led by captain Derian Hatcher, coach Ken Hitchcock and goalie Ed Belfour. It was the Sabres’ second Stanley Cup Final appearance, the first being a loss to Philadelphia in 1975. It was the third appearance for the Stars’ franchise, and their first since moving to Dallas from Minnesota in 1993. Minnesota (known at the time as the North Stars) lost in the Final to the NY Islanders in 1981 and to Pittsburgh in 1991. The Stars defeated the Sabres four games to two to win their first Stanley Cup, becoming the eighth post-1967 expansion team to earn a championship. This was the first time since 1994 that the Stanley Cup Finals did not end in a sweep.